Summertime is a fun and happy season full of cookouts, outdoor activities, and relaxation. 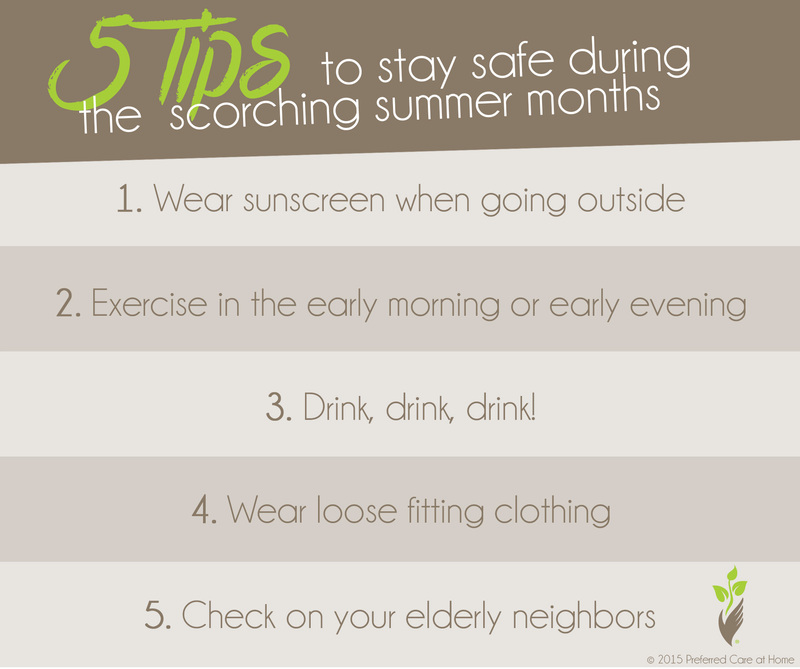 What some people don’t realize, is that the summertime can be a very dangerous time for older adults. The sun and the heat may seem like welcomed changes from the snow and the cold from the winter months, but they can pose serious health risks such as skin cancer, heat stroke, and dehydration. According to American Cancer Society, skin cancer is the most common form of cancer, with over 3.5 million new cases diagnosed each year in the United States. Even when it’s cloudy out, the sun’s dangerous rays can cause burns, which are not only be painful, but they can also lead to skin cancer. Reapply your sunscreen often, especially if you have been swimming or sweating. It is much cooler when the sun isn’t fully out, so planning activities such as walks, gardening, and bike rides for early mornings or evenings can help keep you from getting overheated. As people age, there are many changes that happen in their bodies. One of these changes is that their response to heat. Older adults tend to have a slower response to heat, and often don’t start sweating until their temperature is very high. Since sweating is our body’s natural way of cooling us down, it takes older adults much longer to cool down than younger adults. As people age, they feel less thirsty and tend to drink less. This can lead to dehydration, which can have dangerous consequences. Drink water and juices, but limit caffeine and alcohol consumption, because they act as diuretics, which can also lead to dehydration. Wearing tight fitting clothing causes body heat to be trapped, so loose clothing allows body heat to escape so that the body can cool down normally. Make it a point to introduce yourself to your neighbors, and to frequently stop by to check to make sure that they are doing well throughout the hot summer months. Have fun this summer, but make sure to take precautionary steps to protect yourself and your senior loved ones from the sun and heat.